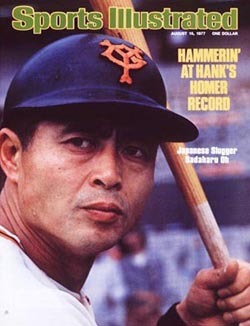 In August of 1977, Sports Illustrated ran a cover story highlighting Oh’s dominance of the Japanese baseball and influence on the global game. In it, writer Frank DeFord posted the question of whether the man known as the “Japanese Babe Ruth” would have been able to compete in the U.S. The response from U.S. contemporaries (players, coaches and managers alike) was virtually unanimous...Sadaharu Oh could be a dominant hitter in any league, even playing against the MLB’s best. Here’s how he matched up against MLB players of his era. In 13 Japan series games, Oh hit 25 home runs against visiting pitchers including: Hall-of-Famers Steve Carlton, Jim Palmer and Tom Seaver. And he would know, having hit more home runs than anyone else in the history of the game. Oh had 95 multi-homer games in his 22-year career, including: 90 two-homer games, 4 three-homer games, and 1 four-homer game. These amazing batting stats led him to win two consecutive Triple Crowns in 1973 and 1974 and nine MVP Awards. In addition, he was named an All-Star in 20 of his 22 seasons.